State Library Victoria – Glorious news! Separation at last! Glorious news! Separation at last! 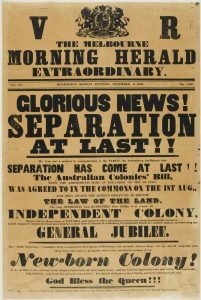 On the 11 November 1850 the people of Victoria, then known as the Port Phillip District of New South Wales received the news that the British Parliament had passed legislation granting the separation of the district from New South Wales. It was a colonial era version of Brexit. The announcement was received rapturously by the local community which saw several days of celebrations. Edmund Finn aka ‘Garryowen’, a journalist with the Melbourne Herald newspaper was among the first to learn the news. He had taken delivery of some South Australian newspapers which had recently arrived via ship from Adelaide. In them he noticed a small summary of news from England which noted the passing of the Separation legislation in both Houses of the British Parliament. Finn immediately organised the printing of a Melbourne Herald ‘Extraordinary’ and saw to it that this was distributed immediately to the ‘residence or business place of any notability’. Word quickly spread about the ‘glorious news’ and preparations for celebrations long anticipated were now enacted. The next day on the 12 of November a Royal Salute witnessed by about 300 people was fired from Flagstaff Hill which was then returned by all the vessels in Port Phillip Bay. The following evening saw a display of fireworks on a scale never seen before in the colonies. To ensure all residents could participate in the rejoicing the Mayor of Melbourne notified the public that three days of general holidays would be observed. The level of local patriotism surrounding this can be gauged from an editorial in the Argus which in part read, ány man who opens his place of business with an eye to filthy lucre may be handed down to all posterity as a grovelling, sordid wretch’, and who would be úttlerly unworthy’ of Separation. Others were inspired to celebrate in poetry. The grandest part of the celebrations was a grand procession of thousands of people from William Street in the city near where the Law Courts now are, passing over the newly opened Princes Street Bridge to the grounds where Government House would be built some years later. The residents of Port Phillip were happy for many reasons. Separation and self-government would bring practical benefits such as the ability to more quickly address local issues and give their local government control over their own revenue and expenditure. Many of the colonists in Melbourne also came to believe that the government in Sydney was either ignorant or indifferent to their concerns, or even engaging in cynical exploitation of Port Phillip’s prosperity for the betterment of the citizens in Sydney and other parts of NSW. Such feelings helped stoke the great Sydney-Melbourne rivalry which developed over the years. The celebrations eventually subsided and concluded with a fancy dress ball on the 28 November. Preparations for self-government which was legislated to begin on 1 July 1851 now began in earnest which was just as well because there were tumultuous times ahead. Within a year gold was discovered in the newly named Colony of Victoria and a great period of rapid economic, social and political transformation took place over the next few decades. 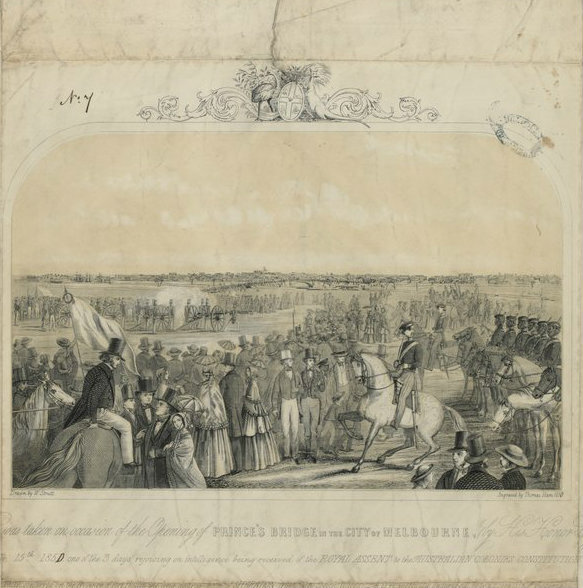 Some of the events of these times were recorded by artists such as William Strutt who is featured in an exhibtion Heroes and Villains: Strutt’s Australia on show at the State Library of Victoria from 14 July until the 23 October 2016. Guess nothing has changed Tim. Love the Argus mention ” ány man who opens his place of business with an eye to filthy lucre may be handed down to all posterity as a grovelling, sordid wretch’” – surely this is reminiscent of Bob Hawke! Thanks Susan, the language changes, but the meanings don’t!